If you were wondering how good Amazon’s current deal is on the Tile Mate and Slim Combo Pack 4-Pack, we can put it into perspective for you very easily. 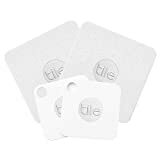 For $39, you get two Tile Mate trackers and two Tile Slim tracking tags, and the entire bundle ships for free. By comparison, a single Tile Slim will cost you $30 if you buy it on its own. In other words, you’re crazy if you pass up this deal.